When you're living a wildly budget lifestyle in what feels like the most expensive city - ever - it can drive a girl to imagine a life sprinkled with unnecessary, gorgeous trinkets. I find myself spending too much time ogling all sorts of baubles that are far beyond my means, but it also leads me to seek out comparable substitutes that are almost as sparkly and much more obtainable! 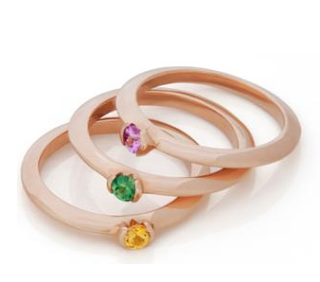 My latest crush are these simple and glittering little rings by Alberto Parada. They're absolutely lux, but they're also made from sustainable materials (100% reclaimed 18k gold - did you even know there was such a thing? ), and look best when stacked in multiples. Aside from her really darling sweater, Mila Jovovich is rocking a AP cocktail ring on her pinkie, and I'm kind of digging it. I feel like I went through a pinkie ring phase in my younger youth (I think I just made that term up), and I've got a bit of a mind to try and bring it back. I love these! I adore stackable rings, but sometimes they look silly on me because I have such short hands/knuckles.